Let us set the stage for you: It’s Saturday night at a solid-booked restaurant. You and your beloved stare into each other's eyes while a violinist quietly serenades you in the background and the candles on the table slowly burn lower. Just as you think nothing could be more perfect, the waiter drops the Valentine’s Day special: a slab of meat pressed into the shape of a heart. Every romantic tingle in your body just shriveled up. Maybe it's funny or maybe you will end up going home alone and changing into sweatpants. Unfortunately, the accepted wisdom on Valentine's Day is that heart-shaped food is charming in every iteration, but there are always winners and losers. Here’s a list of dos and don’ts. No one wants to see how it’s made and no one wants to see it in the shape of a heart. 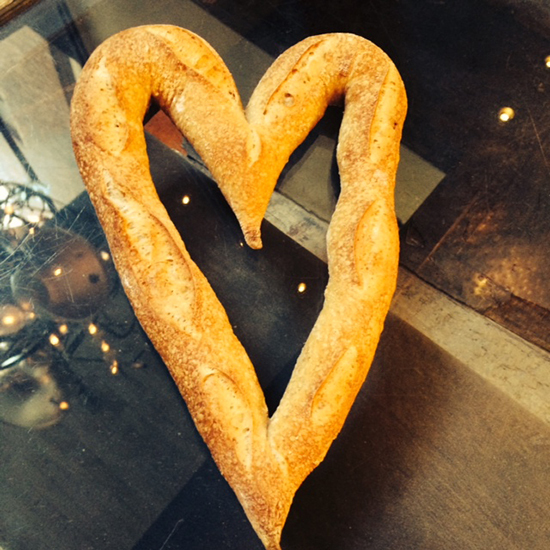 Bread is always OK as a heart. It keeps its shape and it won’t drip or ooze. You can actually pick up one of these awesome baguettes from New York’s il Buco Alimentari on February 13 and 14 for just $5. What is this obsession with heart-shaped meats? Somewhere there must be a video of Ron Swanson explaining there is a special circle of Hell reserved for people who serve non-meat-shaped meat. We’re mostly just impressed that they’re growing heart-shaped cucumbers now. Lance Bass just had heart-shaped lasagna at his wedding. That might be all you need to know about that. It depends what kind of heart-shaped cake we’re talking about. Cupcakes like this? Cute. On the other hand, there are realistic heart cakes out there that will almost certainly end your relationship. At your next omakase experience go ahead and ask the chef to serve you something in the shape of a heart. We dare you. Rice should only every be molded into Pokémon characters.